Wow. I also get up early at times. I must admit, the last thing I am thinking about is; "The trouble with digital photography is there is no analog output." My son has made himself the keeper of (very) old family photo albums that I inherited from my parents. I am very glad that he has taken an interest. Many of the old photographs are studio quality along with snapshots. Unfortunately my dad passed on before I could go through the photos and ask who's who. My mother didn't know since most of the photos were on my dad's side. I can remember my parents having people over and doing projector shows of slides. Even back in the 60s many did slides instead of prints. Kind of a precursor to digital. We had very few prints. Unfortunately many of my dad's slides were lost due to environmental causes which were my childhood memories. I totally agree with you, Curmudgeon. I would like to add that there are some of us"old coots" here in UHH land that started out with a hand-me-down Kodak regular 8 movie camera and transitioned to still cameras only after the movie camera developed unfixable problems. That is my case. I am the youngest of my siblings (and sole survivor) who inherited all the movies made by my father and those I made over a few years. I figure there are about 1.5 million frames per mile of film and I probably have a few miles of 8mm square frame movie film. Fortunately the movie projector my father had still functions and I can relive those old memories. The drawback, nobody else wants to watch them with me. I have two young grandsons, neither of whom is of the age to show much interest in family history or even old family movies. Maybe I can test them out this summer when they come for their visit with Grandma and Grandpa. I'll hope. My wife and her youngest sister are the sole survivors of five siblings in her family. She and I have inherited many family photo albums from her family. 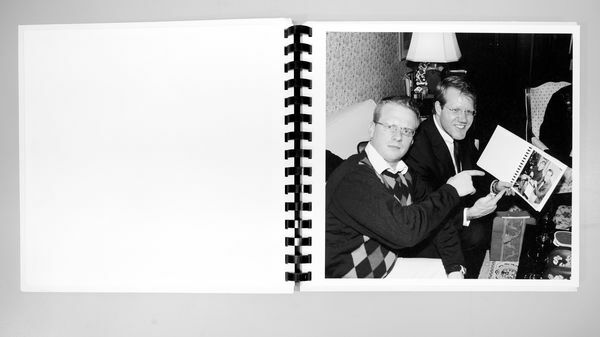 There are so many photos of people we cannot identify and no one else has the information. So what do we do with those old "snapshots" and family photos? This whole discussion reminds me that the art of letter writing is disappearing, too, and soon there will be no material for those wonderful letter collections of historical or literary figures for us to read. Not only the art of letter writing but the use of cursive writing is going the way of the model T Ford. It is being phased out of teaching in schools. I have a Bible given to my father on his tenth birthday by my Great Grandfather. In May, that Bible will be 110 years old. Inside the cover is a very faint, handwritten inscription noting the gifting event. The penmanship is artistic, decorative, legible, and with quite a few flourishes which make it beautiful. That penmanship is now non-existent except maybe a poor copy in some computerized font. This past Christmas I gave each of my grandsons a Bible with a similar handwritten inscription. They may never be able to read it as they are 6 and 10 years old and will probably not receive training how to write or read cursive. Also, my handwriting is nowhere close to the writing of my ancestor. We have albums left by my parents and aunt which my wife has methodically sorted and scanned to keep the colored ones close to the originals. However, I have about sixty glass negatives that my grandfather took in 1906 to 1909 judging by the age of my mother who was born in 1906 and sister in 1908. Most are in good shape, pictures of Lincoln Park in Chicago, mother in a carriage, street pictures of their apartment, and inside with huge flowered wall paper. I am 86 but I never think of age until asked usually by someone at the gym. Looking at pictures of me growing up charges the battery, and relights memories long forgotten. How many pictures will be kept after we are gone? Generally the kids don’t want or need our stuff. I am 86 but I never think of age until asked usually by someone at the gym. What do you do in the gym? Do you find it objectionable when someone in the gym asks your age? Do you look your age and the reason you're being asked is that you are doing amazing stuff for an old guy? My wife and I (we are both 65) were just opining on the same about photos. We've got boxes of family photos from as far back as the 1930's. The current generation of kids and grand-kids love going through them passing them around, and hearing the stories and memories when we get together here. Not so much with all the recent (10 yrs?) digital cell phone images stored "in the cloud" or on wherever else. We've got probably thousands of digital photos that the whole family have taken and shared electronically but they are only seen once or twice, but not shared together in the same way. Something is definitely lacking. My Dad and Granddad used to take 8mm movies at family occasions. We still have the originals and my son had them all digitized, and sent everyone a CD with the digitized copies. Sure, we look at them too, but I'll tell you it is not the same as breaking out the old 8MM projector and screen and having a "movie" night". Unfortunately, that old film is way to delicate now for much of that. I guess that is the only saving grace of digitization in my book. I think all of that is why I am desperately sticking with my film cameras. That being said, I've owned and used some digital cameras since the days of the early Sony Mavica. Without judgment here, I've never considered film and digital photography to be the same animal. To my eye and mind, I see a distinct difference between photographs taken with a film camera to images taken using a digital camera. I've never gotten into developing my own film. I've had neither the strong desire, space , time or money. I have a very good computer, excellent software and a couple of good quality photo printers and a nice scanner. However, side from some resizing, I've not been very interested in the manipulation and enhancement of my film or digital images using computer software. The cost of ink and paper for a quality photo printer is exorbitant.I doubt very much that when you start printing very many digital images, the cost is less than developing and making film prints.So much for saying digital is "free". Ok off the soapbox, I have and frequently use digital (both cell phone and camera) especially for snapshots. I still prefer photo prints to digital images. I regularly print my photos (especially those of my grandson). Maybe it is a generational thing: I am 65. That's how I feel too. Agree with you in every word. I take a photo-digital-of the old paper picture-and edit them also-they usually look quite a bit better -then I send the digital copies email to my relatives-asking them which they want copies of- anyway I send them. Sharpening and contrast do wonders for most of the old prints. People seem to just want to look at them today and go back to the Facebook instant feedback approach but we don't take the time to make permanent copies, nor look at them. Cell phones have not helped either. We are an instant culture today. But I really enjoy finding the old photos and showing them to the family for them. Family photos/albums are treasures. Both my parents are immigrants. About 15 years ago I brought my children and one grandchild to Italy to meet their extended family. When they were younger I taught them Italian. They forgot a lot. We were there for three weeks. After the first week, it was starting to come back. A wonderful visit. We brought back a lot of pictures. My wife went through them and brought them to a friend who owns an Art Gallery on Madison. He then sent them out and they came back...fantastic. You would never know how old some of those pictures are. My grandson still remembers that trip. We are so glad we were able to have these memories. I am the keeper of the photographic tradition in my family. My father started me off - he was a photographer from his early 20's on. When he was a traveling auditor for Shell Oil in the '30s he moved from city to city with a steamer trunk for his clothes, and a smaller suitcase that contained his darkroom, including an enlarger and developing trays. I would "help" him make prints in our basement darkroom in the '50s. (I think I remember DuPont chemicals and papers being used.) But he, and my mother, were only minimally organized. There are a few albums, with photos held on black pages with stick-on corners, but they stop once my brother and I became teen agers. I built a darkroom in my house when we moved in - actually, before all the boxes were unpacked - although I had made do with blacked out windows in apartments for years before that. When we had our first kid in 1980 I made some 8x8 prints for the new grandparents for Christmas and bound them between mat board covers with the binding machine at my office. (I used several roll film cameras back then, and have always just composed and printed square.) They aren't really much more than large snapshots, but they do record some of the events during the year. Somehow that turned into a tradition that is still going after almost 40 years. Every Christmas I routinely make ~1,000 prints from about 250 selected images, that get bound into now 12 different books (not all books are the same, and nobody gets all of the images except me. The grandparents, and a couple of their generation who also got books in the past, are all dead now, but our kids are grown with families of their own, so I still make a lot of books. Still square, and still all B&W. Since I went digital in ~2001, all prints have been pigment ink on matte papers - except the first year when I tried to stay glossy with Lyson inks on Ilford (I think it was) paper, all of which have turned some pretty awful shades. I’m of the older generation and I love new technology. I also like reading a book, I have nothing against reading a book on Kindle. Words are words. Maybe a 86 year old guy(God bless) in a gym may need some help. I'm 75, I don't care if they ask my date of birth. In the 7 years I was in the Marines, (60-67) there were a few times I did not think I was going to see the morning. An alternate view from another curmudgeon. I’m of the generation before baby boomers. While I like reading a hard copy book more than an e-copy, photos are different. I have loose-leaf after loose-leaf and boxes after boxes of 4X6 prints. I almost never go through them. However, I do go to my digital files more often. It is just easier to find what I want; I have a detailed folder system.